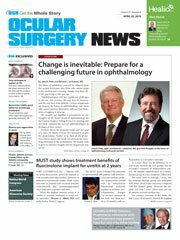 Much time and many articles in ophthalmology journals these days are dedicated to the development of a glaucoma “treatment algorithm.” With so many new treatment modalities in this space, there is a need to specifically define when and where each different treatment option is best applied. Rather than use a different procedure specified to each individual patient, sometimes it’s nice to have a single procedure that works effectively and safely on a wide variety of patients. Cyclophotocoagulation is a procedure that we are all familiar with but perhaps shied away from based on historic studies showing its potential for destruction. Fortunately, MicroPulse technology has transformed cyclophotocoagulation into a procedure with excellent safety and efficacy and a low incidence of complications. Perhaps the greatest feature of MP3 therapy with the Cyclo G6 (Iridex) is its clinical flexibility. It is useful at any stage of glaucoma from mild to refractory, and it can be performed before or after any other treatment, including trabeculectomy. Other options for refractory glaucoma like tube shunts, trabeculectomies and stents are much more invasive and introduce risks for hypotony, infection and other complications that can occur at any time after the procedure, early on or even years after healing. Trabeculectomies and tube shunts both require extensive postoperative care requirements, which can be difficult for older patients, and are more expensive to perform. Patients prefer less expensive, less invasive and more comfortable office procedures with less downtime as opposed to the more involved and costly OR procedures. The noninvasive laser treatment with the Cyclo G6 maximizes IOP lowering while allowing us to avoid these potential problems. Some microinvasive glaucoma treatments are limited to being performed in conjunction with cataract surgery and have other drawbacks. We enthusiastically began using the iStent trabecular micro-bypass stent (Glaukos) but found that it could be difficult to place the stent correctly in certain patients, that it did not always provide the pressure lowering that my patients required, and that reimbursement in our area was inconsistent. While some of our patients have had success with the iStent, ultimately, we quit performing the procedure, as MP3 with the Cyclo G6 is easier to perform, is not limited to cataract surgery and, in most cases, has excellent reimbursement. MIGS procedures such as iStent and CyPass (Alcon) certainly have a place in ophthalmology, but in our glaucoma practice, the practical combination of proven efficacy even in refractory glaucoma patients, the ability to perform in-office procedures without interrupting a normal workflow, and ease of reimbursement have persuaded us that it’s just a lot easier to do something noninvasive in the office. Aquino MC, et al. Clin Exp Ophthalmol. 2015;doi:10.1111/ceo.12360. Kuchar SD, et al. Lasers Med Sci. 2016;doi:10.1007/s10103-015-1856-9. Radcliffe N, et al. MicroPulse trans-scleral cyclophotocoagulation (mTSCPC) for the treatment of glaucoma using the MicroPulse P3 device. Poster presented at American Glaucoma Society annual meeting; April 2015. Tan AM, et al. Clin Exp Ophthalmol. 2010;doi:10.1111/j.1442-9071.2010.02238.x. Disclosure: Toyos reports she is a speaker and consultant for Valeant and Sun; conducts research for Lumenis, Magellan and Kala; is a speaker and consultant and does research for Shire, Mallinckrodt and MixtoLasering; is a consultant and does research for DigiSight; does research for Novaliq; and is a consultant for Iridex. BLOG: The IOP debate — what is the number we are actually looking for?